The Earth Defense Force is once again called into action to defend the planet from an alien invasion. Lauded by gamers as the closest we’ll get to a proper Starship Troopers game, this bug-slaughtering third-person shooter brings hundreds of enemies to the field and offers players up hundreds of more weapons to do the job. 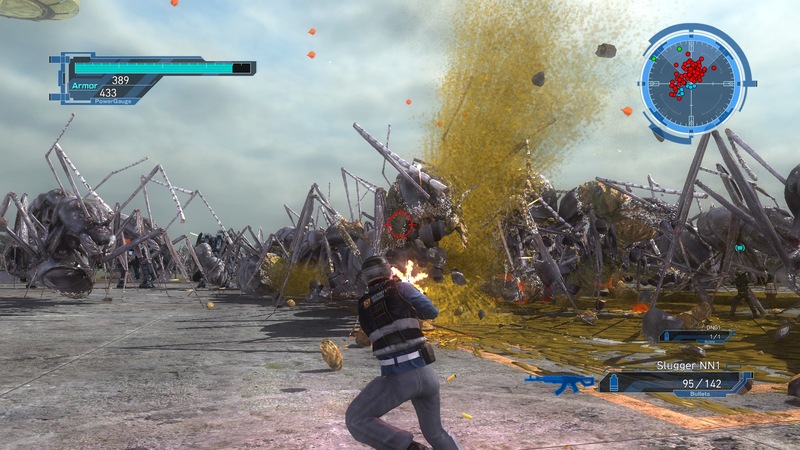 As the first core Earth Defense Force title developed specifically for PlayStation 4, the console power is put to good use powering one of the most explosive sequels to date in Earth Defense Force 5. To cull the planet of giant insects and all other manner of alien foe that wants to take over the world, Earth Defence Force 5’s global group of soldiers fits into one of four class archetypes, each with their own progression and weapon styles. The Ranger’s the most basic of the bunch, relying on traditional military hardware such as assault rifles and rocket launchers. They do get access to some vehicles, like the Air Raider, but a very reduced assortment to work with. Air Raider’s still fulfill the role of heavy artillery, being able to call in orbital strikes, vehicles, and various other ordinance to be one of the strongest types to use in outdoors maps, although much of their abilities are tied to killing enough enemies to earn a supply requisition. The Wing Diver, my personal favorite, commands air superiority of the bunch, flying above the combat and raining down laser weapons, both short- and long-range. Lastly, the Fencer remains the bulwark of the ground forces, wielding four weapons from melee to cannons and are one of the slowest to work with until you master the core tenets of boost jumping. Each mission of Earth Defense Force 5, of which there are a hundred to progress through and even more to come in a future season pass, brings a wide assortment of alien foe to dispatch. Early missions will have players face off against giant ants or spiders and quickly progress to three-story tall frogs wielding laser cannons or flying motherships that rain down reinforcements from the heavens all the way up to Godzilla-sized kaiju. Strangely, some of the alien types you come across that used to be basic foes in previous games are introduced much later on such as the Retiarius web-laying spider. There’s a diverse range of environments, from crowded cityscapes to wide open fields, that force players to change up their equipment loadout (you certainly don’t want to bring an explosive grenade launcher that might take you out along with the enemies in close quarters). The campaign features surprisingly few underground levels which used to be my favorite mission type to bring a shotgun or flamethrower along for. Many of the levels are reused between missions, but when you’re so busy shooting down flying drones to notice passing by the same coffee shop for the fifth time, it’s an excusable bit of level design. 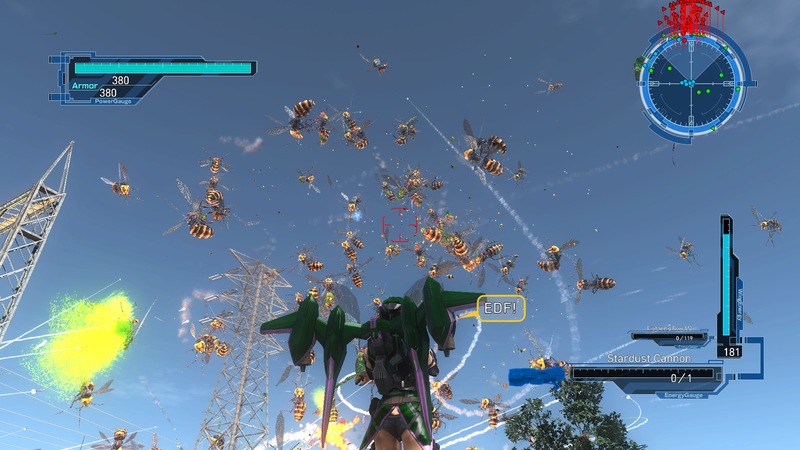 After all, the Earth Defense Force games are all about the thrill of killing hundreds of bugs and not much more. That core loop of Earth Defense Force’s gameplay still remains in 5, although the most noticeable change is the lack of Inferno difficulty available from the beginning. You’ll still be hopping into the same missions, slaughtering both alien and bug alike, and scouring the map for those weapon and armor crates left behind, so that much remains constant. Unfortunately, only three difficulty levels are available from the beginning (Easy, Normal, and Hard) with both Hardest and Inferno locked away until you clear the final mission on any difficulty. This means no more squatting at the end of an alley or up in a tree and slowly chipping away at enough giant ants to unlock a level 70+ weapon and making the rest of the game a cakewalk. It’s a change that’s bound to be quite polarizing to the EDF community (I personally prefer having INF available from the beginning) but this should hopefully prevent newbie soldiers with only 200 armor from jumping into an online match and being more of a handicap than a help. New weapons are given to the player like candy from a loot-filled pinata if the pinata was shaped like a giant ant. With hundreds to add to your arsenal, chances are you won’t have a favorite gun for very long. 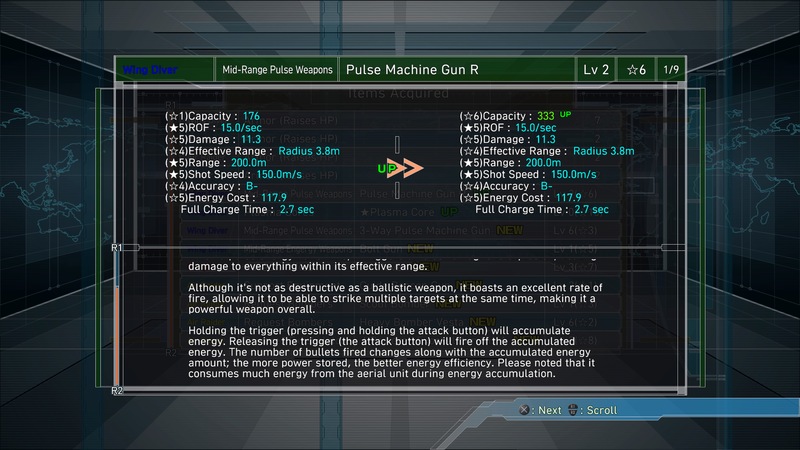 A new upgrade system in Earth Defense Force 5 will gran the players higher firepower if they pick up a weapon they already owned a copy of. That assault rifle you’ve brought into every fight as a Ranger might see more damage or a faster rate of fire with continuous upgrades until the weapon is maxed out, indicated by a star next to its level. Earth Defense Force 5 features a great number of quality of life changes that returning soldiers should appreciate. Both Ranger and Air Raider are given a new dash ability that makes getting around the massive maps faster with the added bonus of having a small radius for picking up items. The same goes for Wing Diver, although she’s far more nimble in the air with an evasive barrel roll to get out of danger. Unfortunately, for most of the early campaign, Wing Diver’s just don’t have enough energy to power both their weapons and jetpack to stay mobile most of the time. She truly shines later on in the second half of missions when she can remain airborne while melting enemies away with her Stardust Cannon or focused lasers. Most of her weapons have been changed to requiring a charge-up to use, leaving her defenseless for a few seconds and sapping away the same energy that could be used to fly away from combat. 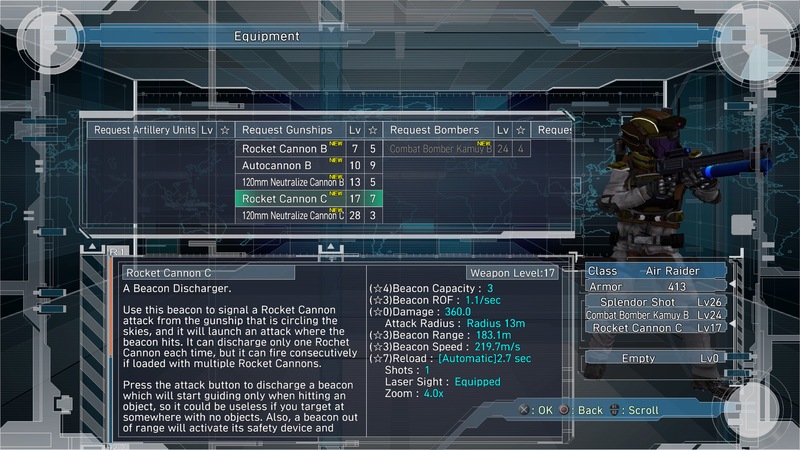 In addition to hundreds of weapons for each class in Earth Defense Force 5, a new equipment system gives each class new customization options to fit the player’s fighting style. Rangers can choose between equipping gear that might increase their movement or item radius or have the option to bring along a vehicle to the fight. Wing Divers get different energy cores to power their wingsuits with specializations between mobility or weapon recharges. Air Raiders and Fencers also get similar equipment options that can change mobility options or how their weapons behave, such as allowing a multi-rocket launcher to lock onto the same foe multiple times for massive damage. Graphically, Earth Defense Force 5 is the best looking of the EDF titles to date, but they still aren’t much of a looker. These enemy models have been reused from game to game and while the fidelity is somewhat enhanced and these models are crisper, they really look no different from their PS3 counterparts. Of course, EDF veterans aren’t looking for those extra pixels or awe at the new blood splatter effects when you shoot down a cosmonaut. What matters most in EDF is how well the system can handle hundreds of enemies at once and the player(s) that are looking to shoot them down. Overall, the framerate holds up quite well on infantry-focused missions on the PlayStation 4 Pro and swiftly tanks when alien motherships or orbital lasers get added to the mix. That slowdown has always been at the heart of the EDF gameplay, giving players a little bit extra time to consider where to fight or retreat, so I’ve been conditioned to accept the slowdown as just part of the experience. Having slowdown in 2018 is unfortunate, but forgivable in this latest iteration of Earth Defense Force. I’m just grateful that the game never turns into a slideshow unlike PS3’s Earth Defense Force 2025. Now if only Sandlot could get rid of the camera lock whenever a new enemy type shows up in missions. If I were to be trapped away on a desert island with just one game, I would definitely pick Earth Defense Force 5. There are enough missions and variety in weapons and classes that I’d never get bored of hunting bugs. This iteration of PlayStation 4 features a great number of positive enhancements, and while the negatives are more pronounced (being unable to start on Inferno difficulty) this time around, the purity of slaughtering everything in sight with progressively bigger and more badass weaponry shines through. Don’t just consider getting a copy for yourself; get three for your friends and tackle Earth Defense Force 5’s online campaign together. After all, the EDF doesn’t leave a man behind. Offline mission progression still doesn't carry over to Online, so enjoy going through twice as many missions!